Push Me all over the world! A few days back I spent a morning perfecting another new skill – burning some of the PUSH ME short films onto dvds. I’ve never been involved in that side of production before and now have a new found respect for anyone who hands me a dvd – I now know how long it might have taken them to burn me a copy! So why was I busy burning like this? 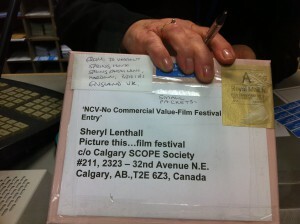 I was packaging up some of the works to send to the Picture This Film Festival in Calgary, Canada. Each year in February, the festival shows both films that are about disability and films on any subject that have been produced, directed and/or written by people with disabilities. Its both a competitive and exhibition festival that aims to changing people’s perceptions – leaving audiences feeling they have been entertained, learned something new and with a greater understanding of disability around the world. It sounds the perfect place to pitch PUSH ME! We will also be showing some of the short films next week in Hong Kong at the Hong Kong Film Archive in a private viewing for critics and curators to talk about disability representation in film, and hope also to show the documentary – if its up in The Space – at the end of month in Australia as part of the 2012 Arts Activated Conference on arts and disability in Sydney, and next March some of the films will also be shown at the Spanish 5th Conference on Social Inclusion and Education in the Performing Arts which is to take place in Barcelona… They certainly are getting out there, illustrating that disability arts are as varied, challenging and creative as any mainstream arts projects. Nothing like it exists. It is an archive that is being used by academics to show students what work is out there - I am using it for a teaching session next week at arts university college Bournemouth. We want to know where you might be pushing people to see them – and what they are saying about them. Do let us know. This entry was posted in The Space, Unlimited and tagged dvds, film festivals, Hong Kong Film Archive, Picture This. Bookmark the permalink.